Inadequate Lightning was one of the more minor members of the Annihilators. 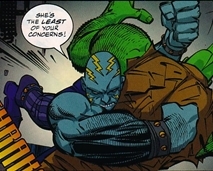 When the group went up against the ranks of Freak Force, he was defeated by Barbaric. Many years later, Inadequate Lightning was amongst those super-freaks recruited by Mako to take the fight to Solar Man, only to have their ranks utterly decimated by the death-dealing hero.